What are Crowns and what do they do? Dental Crowns are known as a cap or a fixed restoration that is used to cover a structurally compromised tooth. The purpose of fabricating crowns for such teeth is to protect them from further damage, give them structural stability, and to restore their functionality and aesthetics. Crowns are needed for teeth that have undergone Root Canal Treatments, sustained fractures, or have subject to destructive dental caries. In some cases, they may also be used to cover teeth to make the smile most aesthetically appealing. What does the Crown procedure involve? For a crown to be placed on a tooth, the patient’s tooth first needs to be slightly trimmed down. When ideal reshaping has been achieved, an impression of the tooth is taken, along with the shade of the natural teeth in the oral cavity. Based on this impression and the selected shade, a crown is fabricated in a dental laboratory. This crown is then placed on the tooth, and fixed with the help of a strong dental cement. What are bridges and how are they placed in the oral cavity? Bridges are used to replace a single missing tooth, or multiple missing teeth in the oral cavity. The technique uses the shoulder principle to place a crown atop an empty tooth socket. This fixed dental prosthesis uses the support of the patient’s sound teeth adjacent to an empty socket. During the procedure, one of the patient’s tooth on either side of the socket is trimmed down slightly. 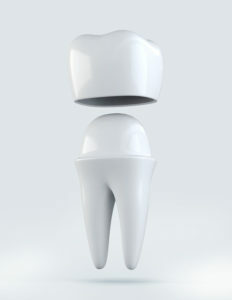 An impression of this unit is then taken to record fine details of the teeth, ridge, and the surrounding soft tissues. Based on the location of the tooth socket in the oral cavity, bridges can be fabricated using porcelain, metal or a hybrid or both materials known as PFM (Porcelain Fused to Metal). Once the prosthesis has been successfully prepared, it is placed atop the adjacent teeth to check for proper seating, and ideal bite. It is fixed in place with the help of strong dental luting cements. If you wish to learn more about how crowns and bridges work, give us a call today! Our team at Rock Ridge Family Dental is always looking forward to helping you out!